Cast iron cooking especially with skillets probably brings up sentimental memories in most of us. Momma could really turn up some special meals with that old favorite cast iron skillet of hers. It meant a lot to her too! She wouldn't even let me wash it! That was because of the seasoning that had acquired on it. It took her a long time to get that skillet cured to that point and she didn't want to lose it. Now you can own one just like hers! We now offer our cast iron skillets both seasoned and unseasoned. The seasoned skillets are a little more expensive but they save a lot of time. But some folks will want to make their skillet just the way they want it so they can be assured that they have done it Their Way. I can appreciate both ways! Pre-Seasoned Cast Iron cookware is made heavy-duty, rough and rugged, which is ideal for frying fish, chicken, hushpuppies, fries and more. Grill or broil your favorite dinner foods with this pan set that goes easily from the stove top to the oven. This 3 PC Set comes with a 6", 8", and 10" pan. This thing is BIG! And it's Cast iron so it heats evenly! Fry a dozen eggs and the bacon to boot. Great for large campouts. Preparing food for a lot of people? This large cast iron skillet will create recipe after zesty recipe, year after flavorful year at home, in restaurants or at campsites. Foundry seasoned, ready to use upon purchase. Use on all cooking surfaces, grills and campfires. Oven safe. Sauté, sear, fry, bake and stir fry to heart’s content. Long lasting durability, resistant to chipping and warping. Greater heat distribution and retention. Keeps food warm longer. Easy to clean surface. Non-Seasoned. Pre-seasoned cast iron from Lodge. Seasoned with kosher-certified oil and can be used on a stovetop, in an oven or over a campfire. 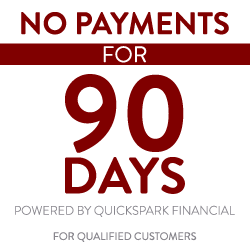 Great for large groups at an exceptionally reasonable price! Use for a long cooking stew or even an upside down pineapple cake. This 17" Skillet is a masterfully crafted piece of cast iron designed to produce large meals, or to sear several steaks at one time. It’s always ready for a weekend of camping! This preseasoned cast iron skillet has loop handles. Measures 17" diameter x 2 1/2" deep. 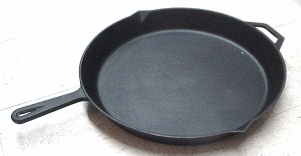 Light weight cast iron skillet. Porcelain coated red on the outside and white on the inside. Superior heat distribution and retention, evenly heating bottom and sides; even, knob is safe to 400°F. Two layers of very hard, glossy porcelain enamel are chip resistant and easy to clean. Porcelain surface eliminates the need to season cast iron. Can be used on gas, electric, ceramic and induction cook tops, and in oven. Not recommended in microwaves, outdoor grills, or over open outdoor flames. Preseasoned by Lodge and ready to Cook! Wonderful for an egg, grilled sandwich or even warm-ups. Preseasoned by Lodge and ready to cook! Wonderful for grilled sandwich, steak, chicken or veggies. Pick one up today for your snack bar, grill, bistro or home kitchen. Use on all cooking surfaces, grills and campfires. Foundry seasoned, ready to use upon purchase.Sauté, sear, fry, bake and stir fry to heart’s content. Cast Iron Skillet 10 1/2 in. Designed for the gourmet, our unique Chef Skillet has sloped sides with our traditional teardrop handle. 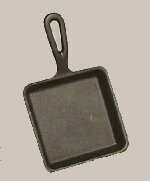 Great for omelets, cornbread or sauteing. Pre-Seasoned. Cast Iron Deep Skillet - 10.25"
Sturdy integral, ovenproof handle and assist handle provides life long durability. Tightly controlled metal chemistry and exacting mold tolerances deliver consistent product for even heating and superior cooking performance. 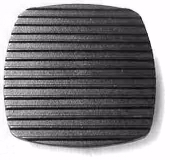 Natural sand mold finish provides ideal surface for best seasoning results. Self seasoned and ready to use. 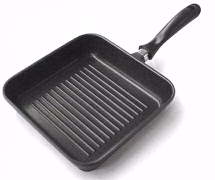 This deep skillet is perfect for Chicken Frying or as a multi purpose cooking vessel. 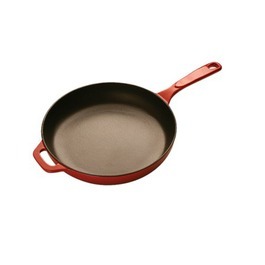 Utilizing Lodge's exclusive Pre-Seasoned finish, this pan is ready to use. No pre-seasoning required. Capacity is a full 5 qt and comes with self basting iron cover. Perfect for slow frying or cooking chicken to perfection. Measures: 12" Diameter & 3 1/4" deep. Sqaure Steak press fits #612001 above. Gives steaks nice grill marks on both sides. Great for those grill marks indoors. Make grilled cheese or steaks. Whatever tickles your fancy. This is an enameled cast iron skillet. Dark blue enamel outside. Easy to clean. 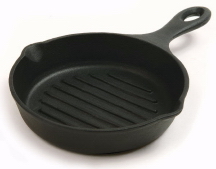 This cast iron griddle is round and flat with a flat handle for easy handling. Make that perfect pancake, flapjack or even cook you tortillas on it. This griddle is unseasoned. Square Skillet there is no wasted space when it comes to bacon strips and French toast. Great for cakes as well. Measures 10 inches Square with a 2 inch depth. * Durable, heavy duty pan that will last for years. * Raised ridges leave attractive grill marks on sandwiches, steaks, and burgers. * Ridges hold food above cooking oils for healthier, less fat fried foods. * Polished, Mirro-bottom for quick heat conduction and attractive appearance. * No heat sturdy handle. * Durable, easy-to-clean, nonstick surface. Cast Iron Skillet 9 1/2 in. Cast iron skillet measures 8" across. 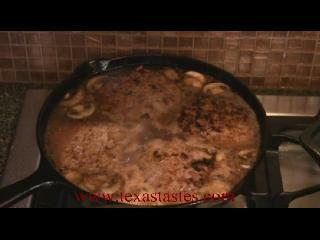 Make that famous pan of biscuits or that famous gravy to go with those biscuits. Cooks evenly and . Seasoned, ready to use. This skillet is a kitchen's most essential item. The even heating of cast iron is necessary for golden, tender, perfectly pan-fried chicken. What other cookware can rival the heat retention, versatility, value and durability of cast iron. Raised ridges drain excess fat from foods. Just the right size for hash browns, hotdogs, grilled cheese, paninis, pork chops, hamburgers, chicken breasts, vegetables and fixings for fajitas. Cast iron pre-seasoned with natural oils and ready to use! Great for single meals or separate servings. This skillet is pre cured. The mitt features heavy-duty cloth fabric on the exterior with a silicone-lined interior. Heat-resistant up to 250 degrees F, the handle holder fits over stainless or cast-iron handles, indoors or at the barbecue, and comes in Camouflage print. 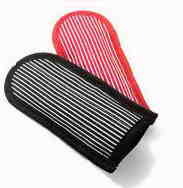 Protect your hands from hot pot handles with this slip-on handle mitt. This silicone handle holder is heat-resistant and a great addition to any kitchen. Just slide the holder onto the hot handle and remove pots and pans with ease. The special silicone offers protection up to 450-Degree. Creates a safe and comfortable grip of hot cookware handles. This handle holder is flexible enough to store compactly in a drawer. Lodge presents one of the nations premier chefs John Folsen. This is a truly amazing cook book with time tested recipes. Recipes cover New England to The Bayou Region. You won't be disappointed with this book! This stiff bristled brush is specifically designed for easy cleaning of your cast iron pieces. Ergonomic shape grips easily in the hand and is comfortable to use. The natural wood handle has a lacquer finish and helps to repel water. The brush head features an embossed Lodge logo on a skillet shaped head. Bristles have a strong adhesion to the head of the brush for long lasting use. When cleaning the brush, hand wash only for best results. Made for scrubbing pots, pans and dishes, as well as food scraper. 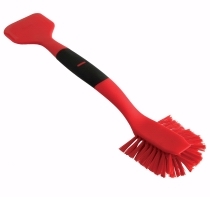 This handy brush/scraper with center comfort grip handle is the perfect combo to get the cleaning done, quick and easy! 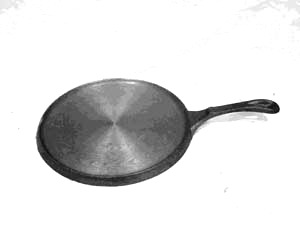 Skillet Cover Lodge 10 1/2"
Will fit pots or skillets w/ 9 1/8" to 9 1/2" I.D. Upgrade your skillet or Dutch oven with a tempered glass lid. 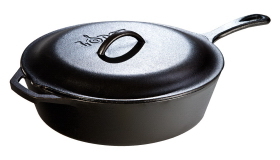 Lighter than cast iron and way easier to see through, this lid is great for frying, roasting and simmering. 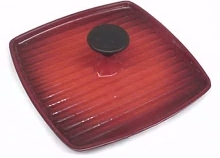 Upgrade your square skillet or grill pan with this tempered glass lid. Lighter than cast iron and way easier to see through, these lids are great for frying, roasting and simmering. The strong, durable phenolic knob is oven safe up to 400 degrees Fahrenheit, and the entire cover is dishwasher safe for easy cleanup.10.5" Fits Square Skillet and Square Grill Pan. Make perfect Italian panini sandwiches. Cuts cooking time in half by grilling both sides at once. Heavy weight cast iron heats quickly and evenly, edge to edge for toasty results. Non-stick ribbed grill. 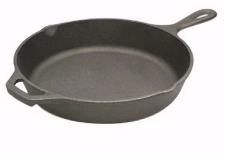 Ideal with any skillet, fry pan or griddle 12" or larger. Has a roud plastic handle on top and ribs on bottom. Turn a plain old sandwich into something to drool over. Our cast iron Panini Press holds heat like a champ, giving your meal attractive grill marks while speeding up the cooking time. It works great as a grill press for steaks and chicken too. Preseasoned. The benefits of cast iron shine in this grill press. Just like a Panini Press, but without the ribs, the Flat Iron Press maximizes the contact between heat source and food. Crispy bacon and seared steaks come out perfectly, and in less time too. Preseasoned.